Microsoft Flight Simulator: Steam Edition includes hundreds of hours of exciting single player missions which will test your skills as a pilot. However, if you want to take to the skies with your friends the Steam multiplayer system offers simmers a number of different options to do this. In this article we will be covering the basics that you need to know to a set up and host a session using your local area network (LAN). Steam allows you to locate a host or attract participants into a session you are hosting by using your local area network. 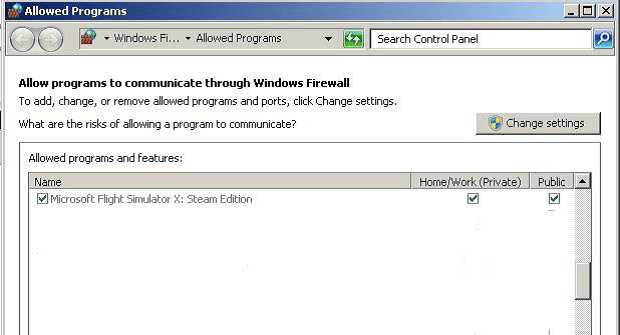 Once you have opened FSX and selected the “Multiplayer” tab, select the LAN option and enter a name before clicking the SIGN IN button. Please note you must be connected to the Internet to sign in via LAN, and if you are using Windows Firewall, you must ensure your LAN is identified as being either a home or work network. 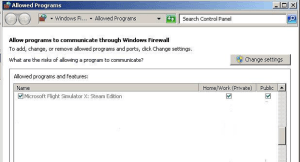 FSX needs to be able to access Public networks, so make sure your Windows Firewall correctly allows full access (see image). If you want to use multiplayer, but do not wish to advertise the session, you can host a private game. To connect to a private game, click on the “Connect Directly” option, enter the IP address of your host’s server, and click FIND SESSIONS. Once you have signed in, you will be able to access existing sessions. Select the Session Name you would like to join, and click JOIN. You can then choose your aircraft, ATC name, and your starting location.